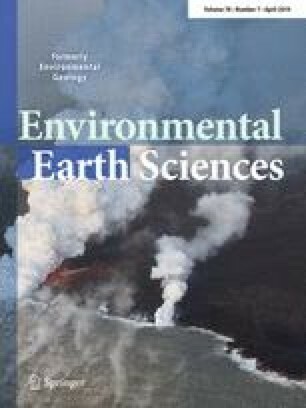 The transport and fate of hexavalent chromium Cr(VI) in slag–soil system, which remain poorly understood, are of great importance for environmental risk assessment and pollution control of Cr(VI) in soil and groundwater. Based on the migration behavior of Cr(VI) in the chromium-containing slag under the effects of rainfall, the transport and fate of Cr(VI) in soil were investigated. Batch and column experiments were undertaken to clarify the Cr(VI) adsorption and transport behavior of aqueous Cr(VI) in soil, respectively. Findings from a combination of experimental and model results clearly suggest that the adsorption of Cr(VI) onto soil is a spontaneous chemical adsorption process. For chromium-soil transport system, the constructed HYDRUS-1D dynamics model is a good simulation for Cr(VI) migration in soil, as the modeling yielded adequate fit for simulated and measured values of Cr(VI) concentration in soil (correlation coefficient R2 = 0.99). The transport modeling then was utilized to assess the transport of Cr(VI) in slag–soil system. Up to the year of 2018, the concentration levels of Cr(VI) in the soil-leaching solution attained 905 mg/L. Due to the thin layer of soil and the high mobility of Cr(VI) in soil, it is no doubt that the Cr(VI) leaching will engender serious pollution of soil and groundwater in the presence of precipitation. The applications and limitations of the HYDRUS-1D were also discussed, such as bacteria transport, more elaborate biogeochemical processes, coupling of vadose zone processes with existing larger scale groundwater flow models. Tiantian Ye and Hangbin Li contributed equally to this work. This work was supported by the National Natural Science Foundation of China [No. 51204074], Pearl River S&T Nova Program of Guangzhou, China [No. 201710010065], Major Science and Technology Program for Water Pollution Control and Treatment [No. 2017ZX07101003], the China Scholarship Council [201808440005, 201806715037], the National Environmental Protection Public Welfare Industry Targeted Research Fund [No. PM-zx703-201701-058 and PM-zx913-201805-132], the Fundamental Research Funds for the Central Universities (Granted: 2014B16814), and Zhaoqing City Science and Technology Innovation Project (2017S002).